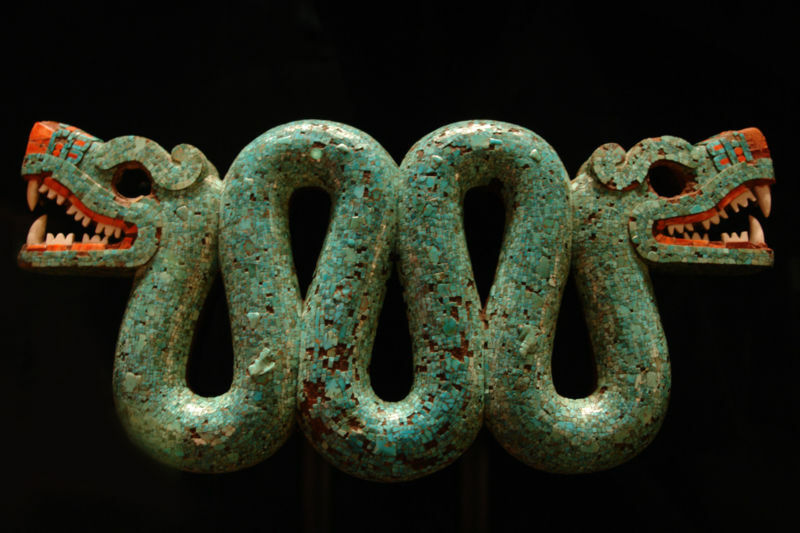 Two-headed turquoise serpent. Mixtec-Aztec, 1400-1521. Held at British Museum. Credits: Wikimedia Commons. On the heels of the last week’s post on the futility of server vs client side debate, here comes an example. I wanted to do this a long time and now the progress of the Bluemix project I am working on has made it important to figure out isomorphic apps in earnest. Why would we want to render on the server to begin with? This HTML will also give something to the search engine crawlers to chew on and give you a decent SEO without a lot of effort. Your app will fit nicely into the Web as it was designed (a collection of linked pages). Why would you want to do something on the client then? You want to provide nice interactive experience to the user – static documents (even those dynamically rendered on the server) are not a lot of fun beyond actual content. You want your page to respond to changes on the server (other users making changes that affect the content of your page) using Web Sockets. You want to provide features that involve a number of panels that need to flow like a native app, and don’t want to reload full pages for that. Today we are not hurting for choices when it comes to libraries and frameworks for Web development. As a result, I decided to write a multi-part article covering some of those options, and allow you to choose what works in your particular situation. For this exsercise, we will write a rudimentary Todo app, which is really just a collection of records we want to keep. There is already a proverbial Todo MVC app designed to test all the client side MVC frameworks known to man, but we want our app to store data on the server, and render the initial Todo list using Node.js, Express and Dust.js. Once the list arrives at the client, we want to be able to react to changes on the server, and to add new Todos by entering them on the client. In both cases, we want to render the new entries on the client using the same templates we used to render the initial list. Since we will want to use the REST API (folded into the same app for simplicity) as the single source of truth, we will use Socket.io library to build a MVC-CV app (full MVC on the server, only the controller and the view on the client). The lack of the client model means that when we make changes to the server model through the REST API, we will rely on Socket.io to communicate with the client side controller and update the client view. With a full client side MV*, client side model would be updated immediately, followed by the asynchronous reconciliation with the server. This approach provides for immediacy and makes the application feel snappy, at the expense of the possibility that a seemingly successful operation eventually fails on the server. Mobile app developers prefer this tradeoff. In order to make Todos a bit more fun, we will toss in Facebook-based authentication so that we can have user profile and store Todos for each user separately. We will use Passport module for this. For now, we will use jQuery and Bootstrap to round up the app. In the future instalments, we will get progressively fancier with the choices. You will notice in the snippet above that we are now inlining the partial we have defined before (todo). The collection ‘todos’ is passed to the view by the server side controller, which obtained it from the server side model. New todos are created by capturing the Enter key in the text area and posting the todo using POST /todos endpoint. Similarly, deleting all todos is done by executing DELETE /todo Ajax call. Notice how we don’t do anything else here. We let the REST endpoint execute the operation on the server and send an event using Web Sockets. When we receive the message on the client, we update the view. This is the CV part of MVC-CV architecture that we just executed. The message sent via Web Sockets contains the state of the todo object that is passed to the Dust renderer. The output of the todo card rendering process is simply prepended to the todo list in the DOM. On the server, our REST endpoint is responsible for handling requests from the client. Since we are using Passport for authentication, the requests arrive at the endpoint with the user object attached, allowing us to execute the endpoints on behalf of the user (in fact, we will return a 401 if there is no user info). We are more-less delegating the operations to the model object, and firing events for verbs that change the data (POST and DELETE). The model is very simple – it uses lru-cache to store data (configured to handle 50,000 users and TTL of 1 hour for entries before they are evicted). This is good enough for a test – in the real world you would hook up a database here. The entire example is available as a public project on IBM DevOps Services. You can clone the Git repository and play on your machine, or just click on Code and inspect it in the Web IDE directly. The app is currently running on Bluemix – log in using your Facebook account and give it a spin. This was the simplest way to achieve isomorphism. It has its downsides, among them the lack of immediacy caused by the missing client side model, but it is blessed by the complete freedom from client side frameworks (jQuery and Bootstrap nonwithstanding). In the part 2 of the post, I will insert Backbone on the client. Since it has support for models, collections and views, it is a particularly good choice for gradually evolving our application (AngularJS would require a complete rewrite, where Backbone can reuse our Dust.js template for the View). Also, as frameworks go, it is tiny (~9K minified gzipped). Finally, in the part 3, we will swap Dust.js for React.js in the Backbone View implementation, just to see what all the fuss is about. Now you realize why I need to do this in three parts – so many frameworks, so little time. Previous postShould I Build a Site or an App? Yes! FYI, the Facebook login on the Bluemix hosted app isn’t working. It says that the app is not properly configured for Facebook Login. Hmmm, I just went there and logged it again. Did you just try http://isomorphic.mybluemix.net, or tried to deploy the forked project. If latter, you need to register your own app and obtain OAuth2 client id and secret.